You are going to need to take the piezo speaker off of your breadboard in order to complete this lab. 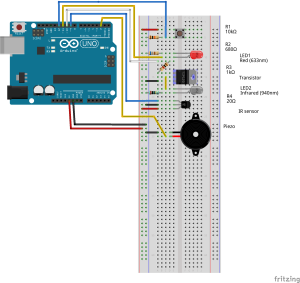 We are going to put the seven segment LED on the bottom of the breadboard and connect it to pins 2-9 on the arduino. You will also have to take the infrared sensor out of pin 9. 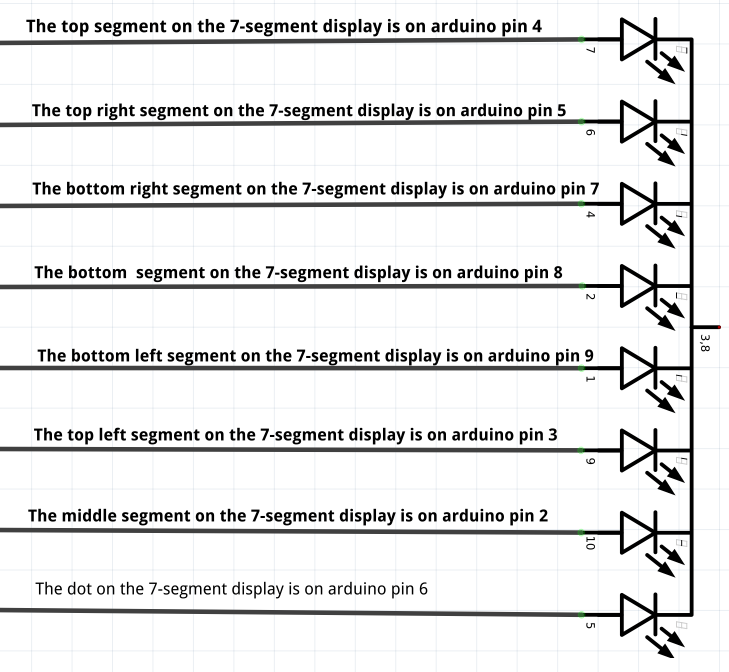 Here is the wiring diagram for the seven segment LED (with all other pieces taken out to make it easier to focus on how to wire the seven segment display, which is sometimes written 7-segment display). 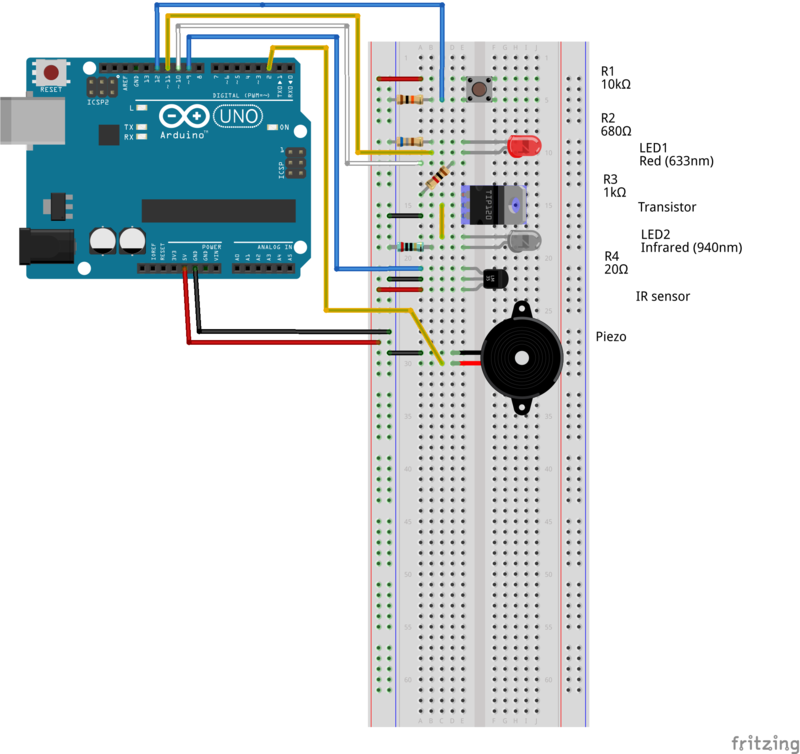 Once we have the 7-segment display wired to the arduino, we are going to need to program the arduino to turn on each of the segments in the 7-segment display in order to display the number that we want it to. There is one more thing that will be helpful to program the 7-segment LED, and that is which segments are controlled by which arduino pins. Below is a schematic drawing of the 7-segment LED. Each of the triangles with a line and two arrows represents an LED. The direction of the triangle shows which way the electricity can flow. It's coding time! To sketch 8. 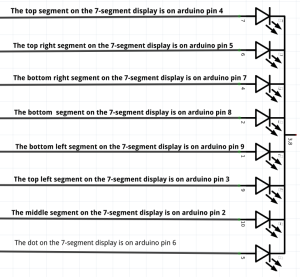 Note: If you want more of a challenge, don't look at the schematic above to program the seven segment LED. Determine what pins control which segments by trial and error. Copy and paste everything below the /*****/ into a new sketch. /* This program goes with Lab 5 of the OpenTag laser tag tutorial. tag, receive a tag, can't tag, and are out. piezo we attached to the piezo_pin, we use the tone function. some code that does the same thing over again a few times? I mean, we have a mail loop, can't we have a smaller one? it does a specific thing. up or counting down. To count up, we put two + simbols. To count down, we put two - symbols. //Xyri mr ribx xmqi. Wii alex M hmh xlivi? Xyri. This lab goes over how to add a piezo speaker to your arduino. One important thing to note about piezo speakers is that they only work within a certain voltage range. If you go outside of the range, you risk breaking them or having them not work. One good thing about piezo speakers is that they only allow a certain amount of current to go through them, so you don't need to add a resistor. Nifty, huh? 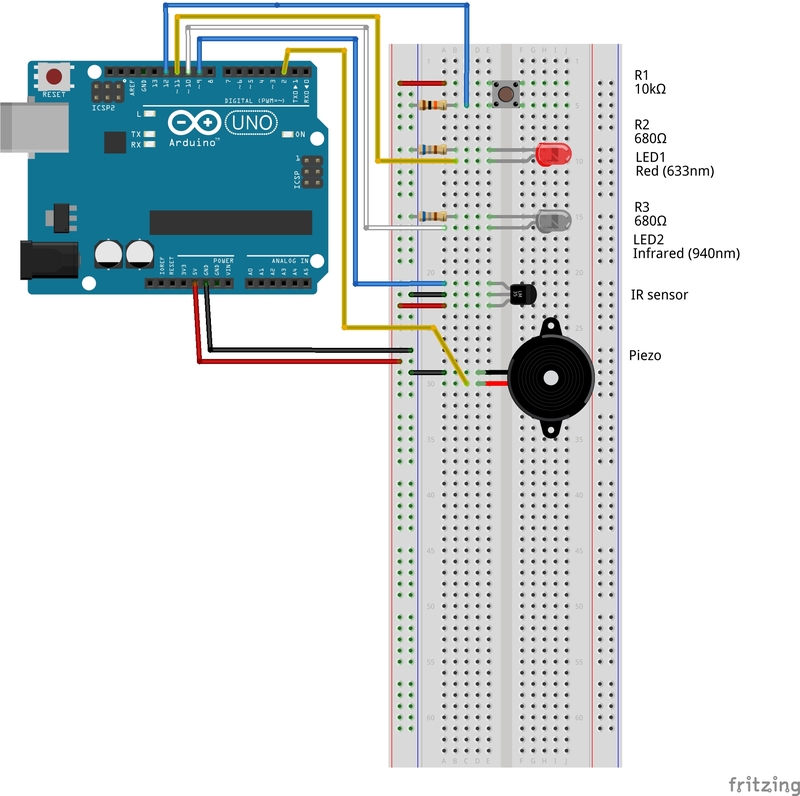 So, how do we connect the piezo to the arduino? Depending on the type of piezo, one of the pins will have a + on it or will have a red wire sticking out of it. The side with the + or the red wire goes to arduino pin 2, and the other pin is connected to ground. Why pin 2? Why not pin 2? You can use any of the arduino's output pins. You just need to let the arduino know which one you use. After you have the piezo hooked up to the arduino, it's time to program the arduino so that we can tell it what we want it to do with the piezo speaker. To the sketch! At this point, we have a pretty basic game of laser tag. From here on, we will be adding onto the code to make the tag unit do more things. One way that we can add onto the laser tag unit is to add sound. To do that, we will add a piezo electric speaker. A piezo is a crystal that makes sound when you apply voltage to it. However, in order to make a sound, you need to send pulses of electricity to the piezo speaker (similar to how we send pulses to the infrared LED). Fortunately, there is a library for sending sounds to an arduino, called the tone library. Tone is already included in the arduino code, so we don't need to download it and tell our computer where the code is. There are a few elements to sound. The one that we will focus on is pitch. Pitch is how high or low a sound is. You control the pitch of a sound by how fast you vibrate the piezo speaker. The faster you send electrical pulses to it, the faster it will vibrate and the pitch will sound higher. We are going to change what pitch of a sound the arduino makes when you send a tag, receive a tag, can not tag and are out. And now, on to Lab 5, where we will learn how to hook up a piezo to the arduino.